Lucy Vine is a freelance journalist who has written for pretty much every magazine going. 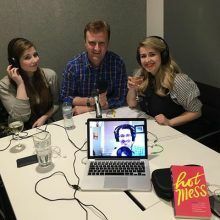 Inspired by one of Lucy’s articles, editor Katie Seaman commissioned Lucy to write Hot Mess, a full-length novel, in an incredibly short space of time and, between them, have discovered a brilliantly efficient way of working together. What is a Hot Mess? Lucy: Most women I know! (She) likes to get drunk, sleeps too much, watches terrible telly and eats badly. Being a Millennial, I think, at this point. Not having any money ever, trying to survive. Lucy: It all started with Katie, at the end of August. I was shifting at lots of different magazines at that point, so she commissioned me to write this book, and I took two months off. So… I wrote it in those two months. Lucy: Because I’m trained as a journalist, and I’ve spent however many years doing that, I get given a deadline and I write it, and I’ve always preferred that overnight commission, where somebody said, ‘I need a thousand words in the morning,’ and I get up at 4am. I hadn’t written a book, even though I’m writing every day and I’m a huge book person as well, but the idea of actually putting myself through the hell of writing a book and then having to pitch and get all that rejection, it just… I know that’s what a lot of people are doing, but I’ve always been too much of a coward for that. It just terrified me, the idea of having to do all that, and the idea of having a whole year as well. When I get given a commission to write something and they say, ‘Yeah, give it to us in a month,’ I don’t do it until that last few days of the month. I actually had a longer deadline (for the book), it was due in January, and I sent it over at the end of November, but I just needed to do it. That first week when I’d actually taken the time off work and I was at home and I was sitting there, ready to write a novel, with a blank piece of paper in front of me, I actually failed a bit, in my head, and just started to panic and I think I had lunch with Katie on the Wednesday of that first week, and I said to you, ‘Can I please have a weekly deadline?’ I know that sounds a bit pathetic, but I said is it okay if I start sending you ten thousand words a week? Lucy: Those first few days, I just lay there in my room, just watching Netflix… You think it’s impressive, how many words I got through, you should see how many Netflix shows I got through. I knew I had to do that, every Friday, send Katie that chunk of work, I just had to do it. Even if I got to Wednesday and I had to get it done, so I did. What was the reasoning behind the two month deadline? Katie: A Hot Mess is most of us out there, thinking about where we thought we’d be in ten years’ time. Are we measuring up to those standards? We’re probably all falling short and feel like we’re failing. It felt very topical, and there’s a lot of shows out there, Fleabag and Girls especially, are really highlighting every day flawed-but-relatable characters. Was it a case of you having a zeitgeist idea and then going and looking for the right author? Katie: I twas Lucy’s article that inspired the idea. Big shout out to Stylist, because I love their features, and it was around Valentine’s Day last year, and you’d written an amazing piece, and it had some stats in there about the amount of people that are single that would choose to stay single, this was when Girls was in full swing, there’d been a renaissance of modern rom-coms on Netflix, shows like Love had just started. So that got me thinking: if I’m out there reading this, how many other women are thinking that maybe, in books especially, there’s not the kind of characters that they can relate to? I reached out to her thinking she’s probably already writing a book, and I was so surprised that nobody had ever approached her. It was such an obvious fit to my mind. We met and chatted. Lucy: I got this email out of nowhere. I thought it was spam. I had a Google of you (Katie). It was so out of the blue, just a few days before my birthday, and it was just so exciting, but at the same time I didn’t tell anybody. You know how you hear about L.A., and everybody’s telling you Oh my God, you’re gonna be such a huge success! and I thought it was maybe like publishing people went around fishing like that…? We met for breakfast the next morning, and you seemed like, Let’s do it. I still feel like it’s a joke and I didn’t really tell many people about it, till it was announced a few weeks ago in The Bookseller. You said to go away and write down a quick brief of what the plot would look like, which I did that week, and then I wrote two chapters, about five thousand words, and then you away and got it all approved. And that was when I went to the people I was booked into and said, ‘I’m taking the next couple of months off.’ Because I’m freelance, it wasn’t a big deal, it’s more that I just… let them down! Betrayed them and left them in the lurch… It was fine, they managed to find someone to take over for me. I didn’t think I’d be back before Christmas, but I did, because I went a bit crazy being in my house for two months. I’m quite a high-functioning introvert, I think. I like people, and I like being around people, but then I really need to just go home and be alone. I’ve got my own flat, and I live on my own, I shut the door, turn off my phone, it was so exciting to me that I had two months to not see anyone, and not talk to anyone, and just be alone and write. It’s just the dream, isn’t it? I’m so lucky that I was able to do that. I find that when you’re writing that other people are an inspiration. I spent a long time doing market research, as it were, towards writing about being single and that kind of novel, but I did still need other people a bit…. eventually. To write that quickly, were you drawing a lot on your personal experience? Katie: This is so true. It does happen. I’d meet the friend of a friend and their first question was, ‘Who are you? What do you do?’ Second question, ‘Why don’t you have a boyfriend yet?’ Third question, ‘When you get married, will you move out of London so you can raise your children?’ This is why this book is so pertinent, it’s so relatable. I feels like we are stuck in a time warp sometimes, that this kind of official life plan, and these are the standards that a lot of women are being held to. It’s so refreshing. We didn’t have to apologise, or defend our life choices. This is a really positive story. You seem to know who you’re writing it for. Did you have that very clear in your head? Lucy: It is that old thing of Write what you know, and lots of people who’ve read it have said, ‘That’s exactly what happened… have you stolen that from my life?’ I think it’s just such a universal experience as a single woman. We’re used to the same Tinder dates, the same reactions, the same family all having babies. My sister has has three kids, there’s this measure of where my life should be and where I actually am. I’m happy with it, and she’s happy, and it works, and it’s all good, but there’s this weird pity. Let’s talk about the editing process. Katie, how were you involved in the two months? Katie: What Lucy did really well, and here’s a general tip, she was aware of what would be her own pitfalls. Us coming up with the weekly deadline was the thing that made it feasible, because she knew that if she was just told to go away and write, it probably wouldn’t have happened. Writing’s quite different from other industries, even journalism, because you write an article and get immediate feedback, that’s one thing you might find quite tricky, because (when you’re writing a novel) you’re not getting that immediate feedback, and it’s solitary. So when you said, ‘I need a weekly deadline, this is how I do it,’ that’s what we decided. Lucy would have a weekly working pattern, and she would do Monday-Friday, work throughout that week, and deliver on Friday, and then I read as we went along, I would read at the weekend and get back to her on Monday. More often than not it was just reassurance, a lot of my emails to you on that Monday were just you’re doing great, this is amazing, this is so funny. It was such a fun read, and it never felt like work, and I couldn’t wait for the next instalment and neither could everyone in the office. I didn’t give that much detailed feedback, but there were a few things, where I flagged that this might need tweaking slightly, but I think it was just giving that reassurance through the process. What was that like for you, Lucy? Lucy: Writing a book is such a weird mixture of having all the ego to believe in what you’re doing, and having no ego, because you then have to let it go, hand it over, and say, do what you need to do. I feel like I’ve been training in that as a journalist for all these years. I really liked it. I don’t think it would be the way for everybody to do it, but it worked really well for us. Because this originated with an article, why did you go for fiction instead of non-fiction? Katie: I think there are a lot of books out that are feminist memoirs, some great books, I just felt that there was a gap in what I could read. I could think of five or six TV shows I could go and watch and recommend to my friends, and increasingly a number of films. I just felt in fiction, some of the old cliches and tropes we’ve mentioned, about pitying looks when you’re single, it felt that things hadn’t moved on that much from some other notable characters, and there was a bit of a gap. So that’s why I thought fiction, and Lucy had a great voice, and that’s what stood out in the article. We met and we chatted and drew up the basic overarching plan of the novel together, so every week I would know what was coming. Is Lucy unusual in that, as a journalist, she’s more accepting of editorial notes than other authors? Katie: I’m still quite young, as an editor, and because it was new to both of us, you kind of learn as you move along. I think that’s why we got into our own pattern and we made our own routine, and it was having the immediacy of feedback and reassurance — which I think most authors aren’t able to get — I think this has been collaborative all the way along and always been a very open door policy if you were struggling, just drop me an email and we’ll talk it through. I think it’s really interesting what Lucy said about those niggling doubts. I would definitely say to people, listen to your gut feeling, because if you have a niggle yourself, then it’s something that somebody else might pick up on. If you know it’s not quite right, then somebody else will feel the same way. The biggest tip that anyone could take from Lucy’s writing is that it’s much easier to work with what you’ve written. The worst thing is having a blank page. That discipline of making yourself sit down and write, even when you’re finding it tough, you’ve got words on a page. It doesn’t matter how rough and ready a first draft is, you’ve got something, and you’ve done it. I think that’s such an important step, and such an achievement in itself to get those words and translate that onto the page. What are the top pitfalls you find as an editor? Katie: I’m still learning as an editor, and as you go along you get to read so many different books, and no writers the same, that’s what so special and unique. I think probably one of the biggest pitfalls is procrastination. I’m sure, as I writer I can imagine that’s probably the hardest thing to overcome, because it’s very solitary. Whereas, if you’re a standup comedian and you go to the pub and you get an immediate reaction, and having that lack of reaction is probably one of the hardest things to overcome. Lucy: You’ve got that with each other. It’s a bit like me and Katie having a writing partnership in the same way that you guys have, you can read each other’s work and help each other that way. When I write my next one I’ll need a bit more contact with other people, obviously I’ve got Katie, she’s all I need, but that contact with other people really helped. Would you do the two month thing for the next book? Lucy: I know! What was I thinking? Sometimes I’d get a big idea for chapter ten and I’d start writing chapter ten, then I’d go back. I kept thinking I would find my rhythm and I never did! I also found, for the first few weeks when I was writing, every single day I was starting again. Which doesn’t work for me so well. I think the first half of the book isn’t as good as the second half — I know I’m not supposed to say stuff like that — but I actually think the second half is quite good. I just think too many drafts and too many rewrites kill the book. I found I was rewriting the first half way more, because every morning I would start at the beginning, re-read, rewriting as I went, and obviously the more I wrote, the harder and longer that took, so I got to halfway through the book and realised I couldn’t keep doing that. I then just started writing a bit more fluidly, and I think too many rewrites means you start being a bit clumsy with your words, and sentences start getting jammed together in an awkward way. Is that something you do as a journalist? Lucy: Yes, and it’s easier when you’ve got a thousand words. I had to stop doing that, and I won’t do it so much. It’s like a warm-up, but you can’t do that when you’ve got sixty-thousand words, you can’t keep reading the beginning over and over again. With Hot Mess you’re ahead of the curve trend-wise, what would you say about spotting trends? With your next book are you looking for the next Hot Mess? Lucy: I don’t know if it’s about specific trends, because you’re not (writing) a magazine. It’s about sensing the conversation, and Katie mentioned things like Fleabag and Girls, so there is something zeitgeisty about being single, but that’s a huge subject and it’s gonna be forever a subject. We’ll hopefully improve a little bit in the way that we treat single women, but I still think it’s going to be continually treated as some kind of limbo state. Bridget Jones, twenty years ago, it’s still the same kind of conversation we’re having. The way we treat single girls as freaks, so that’s always going to be a forever topic. In twenty years this person can still be writing about being single if they want to. I swear by magazines and newspapers, and they are very much in the zeitgeist, but I don’t think books can be in the same way. They can talk about universal themes, about life, and if you can tap into life in that way and figure out what people think and talk about, then that’s great. Katie: This is very topical, to talk about trends. Being aware of them is a good thing, because if you’re currently writing a psychological thriller and they’re books that are really popular right now, it’s really having a moment and continues to do so. I think if you’re aware of trends, that’s good for your own writing, so you could be aware of competing authors, and if you know there are books like yours out there already, then that’s great, because it shows there’s appetite, and people will want to read this. But then think of how you can make your book slightly different. What’s great about Hot Mess, we identified a bit of a gap in the market. As a reader if you think ‘What would I like to read, but I can’t find a book on this?’ maybe that’s a book you could think about writing. Writers need to think like the readers? Katie: Selfishly, this book came from ‘What would I like to read?’ and maybe that’s my ignorance, and I apologise if there’s someone out there that has written something and I’ve not managed to find it, but this is a book that I know I’m going to recommend to everyone. As an author, don’t forget why you’re doing this in the first place, and it’s probably stemming from your love of reading, I think that’s a really important thing to bear in mind. Lucy: If you’re trying to write something because you think it’s going to fill a hole or follow a trend, then it’s probably going to fall a bit flat, because I think if you’re not writing about what you are interested in… you’ve got to write what you want to write about.